The Eastern and Southern African Management Institute (ESAMI) is a Pan African Regional Management Development Centre owned by ten member governments from the Eastern and Southern African region. These are Kenya, Malawi, Mozambique, Namibia, Seychelles, Swaziland, Tanzania, Uganda, Zambia, and Zimbabwe. It is a service and market-oriented institution offering high level specialised management training, consultancy, education programmes and action- oriented management research services. Other countries which regularly participate in ESAMI management development programmes include Lesotho, Botswana, South Africa, Angola, Rwanda, Sierra Leone, Nigeria, Eritrea, Ivory Coast, Liberia, Ghana, The Gambia, Sudan, Ethiopia and Burkina Faso. In May, 1997 the UN Economic Commission for Africa officially designated ESAMI as The African Centre of Excellence in Management Development. This recognition has necessitated ESAMI to extend its services to all countries in Africa. To meet Africa's management challenge in the new millennium ESAMI continues to provide high quality, client centred management development interventions throughout Africa. Promotion of best practices in management. Our mission is to transform institutions through leadership development, innovative education, management training, new knowledge generation and advisory services. Our universe of clients will be individuals, public, private and international organizations. Since its establishment in 1980, ESAMI has made significant contributions in the area of human resources and management development in the region. Its role as a premier Regional Management Development Institute has expanded substantially as a result of increased client demand by countries of the region and beyond. To date over 75, 000 middle and top level personnel in the government, public, private and civic organisations have attended open management development programmes offered by the Institute. ESAMI programmes are based on the emerging needs of the client throughout the continent. The Institute has continued to make sure that programmes benefit from research carried out in the form of needs assessment and participants' feedback. Programme appraisal, tracer studies and impact assessment will form important part of ESAMI's training and capacity building process. The training programmes presented in this prospectus will have a strong link between management and performance improvement at individual and organizational level. Tailor made programmes will be undertaken to address clients' specific problems and issues. These are normally conducted on request and at venues and dates convenient to client. ESAMI launched an Executive MBA Programme which has proved to be quite successful. To date the Business School enrolment stands at 3600 students spread in ten campuses in Africa. ESAMI has also introduced Certificate, Diploma and Bachelors' degree programmes in Business management. A successful institution, managed by African professionals who know the African environment and are committed to its service. A staff with a willingness and commitment to effective improvement and innovations. Regional flavour and character to match the Institute's activities and respond quickly to specific requirements, concerns and priorities. 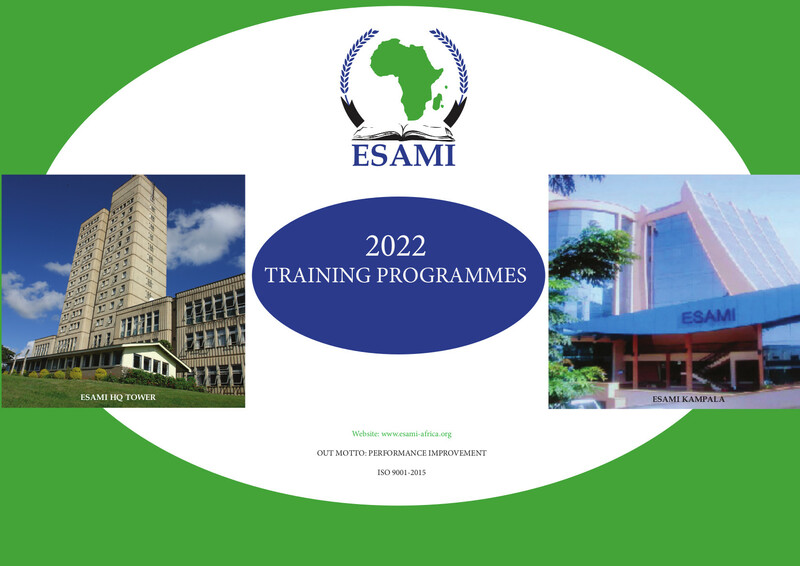 Prospective participants should apply online through ESAMI website or apply for programmes using forms to be obtained from any of ESAMI's offices indicated at the end of this prospectus or nomination form in ESAMI programme booklets or under downloads in this website. The application/Nomination forms should reach ESAMI's offices not later than three weeks prior to commencement of the programme in question. Early application is encouraged to facilitate timely communication. If you would like further information on any aspect of our scheduled programmes or discuss an in-house (tailor made) programme, please contact us on any of the addresses indicated in this website.